The previously small size of Gustav's CDO (clouds around the core circulation) was disturbed by Cuba more than NHC's or our estimations. Gustav made landfall yesterday on the Isle of Youth, as well as, over western Cuba. This pass over Cuba disrupted the circulation so much that the pressure went up 20 mb. The pressure before landfall was at least 941 mb and now all the way up to 960 mb. This was bad for Cuba, but good for the U.S.. Without the disruption of the circulation, the rapid deepening phase would have likely continued into cat 5 strength. At it's strongest yesterday, Gustav was up to 150 mph. 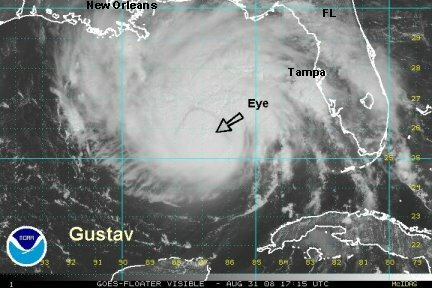 Gustav is now at 120 mph. 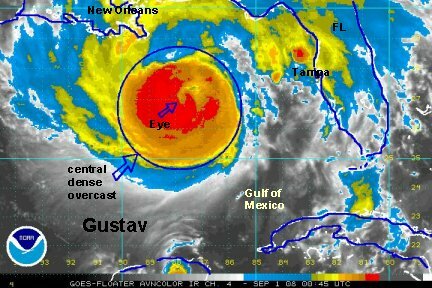 It is now more likely that Gustav will not be able to reach cat 5 strength before landfall. It appears though that Gustav is in the transformation from a small CDO into a large one. This will allow for much more of a tidal surge to develop over a larger area. NHC is talking about the "loop current" warm water scenario strengthening it again. We simply think that after it goes through this transformation stage it will start to strengthen some. The hurricane is lop sided (sp?) at this point. The western eyewall is very thick and strong. The eastern side is considerably weaker. We are still expecting Gustav to organize, which will strengthen it to possibly a cat 4 again. NHC takes it up to 145 before landfall, then weakens it some just before landfall to a strong cat 3 at landfall because of possible wind shear effects. At this point this seems reasonable to us too. The forecast has not changed. 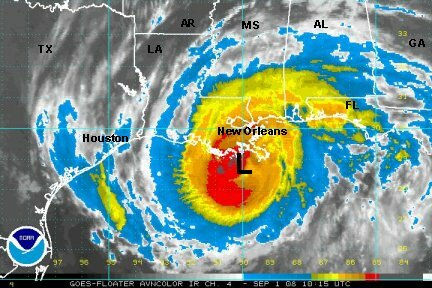 Landfall on the southeast/south central Louisiana coast by noon Monday. 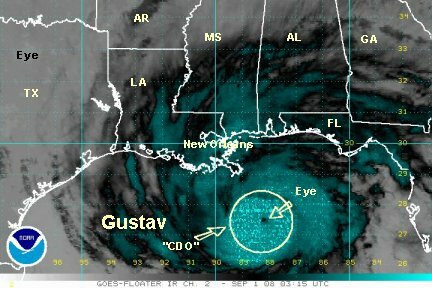 Because Gustav has grown in size, effects may come in many hours before landfall. The weather will especially go down hill late tonight into Monday morning. We will be watching the recon closely to see if the pressure starts dropping soon. We'll know by later this afternoon if Gustav is going to make a run at strengthening again. Listen to local authorities if they advise you to evacuate. Stay informed and stay safe. The last Hurricane Hunter report had Gustav still at 960 mb. It has remarkably stayed steady for 12 hours now. The I.R. and visible satellite imagery show the first signs of possible strengthening. 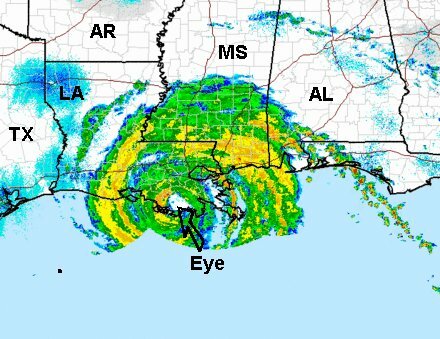 For the past several hours, the eye wall was most impressive in the southwest quadrant. The deep convection seems to be building eastward. This can be seen as the cloud tops on the eastern half of the hurricane are now cooling and becoming higher. If the eastern part of the eye wall organizes, strengthening will commence again. Even at this point, Gustav is still a cat 3 hurricane at 115 mph. A buoy not far north of Gustav reported a 34 foot wave height with the water temperature of 85 degrees. The buoy is out of commission as of 11 am edt. Look for a storm surge of 12-16 feet with large battering waves on top of that where Gustav moves inland and just east of there. Inland flooding is also a major concern. Louisiana, northeast Texas, eastern Oklahoma and Arkansas will pick up heavy rains in the 5-10 inch range or higher as Gustav stalls. The forecast models are slightly faster. Gustav is now expected to make landfall on the southeast-south central coast by Monday morning. The last recon showed that the pressure is starting to drop. The satellite also shows that the convection is rebuilding around the eye. It's starting a strengthening phase. Hurricane Hunter recon data has suggested that Gustav has not really changed that much since moving off of the coast of Cuba. During the day Sunday, Gustav's satellite appearance showed deep convection trying to build east of the center. It really has not made much progress at this point. It is a very asymmetric system with a thick eye wall on the south side of the circulation. The Hurricane Hunters have been providing conflicting information. The pressure has started to drop slowly. It is now down to 956 mb. Typically, this would correspond to a solid cat 3 hurricane. The surface wind reports have have been around 85-90 mph the last few passes. This corresponds to a cat 1 hurricane. We think, due to the asymmetry problem, the winds aren't as high as a 956 mb pressure would dictate. Now to add to the complications, waves were measured at 34' from a buoy and there was actually a ship report of 49.5' wave. We believe the buoy for sure, the ship maybe. So, cat 5 seas have been generated, with cat 1 winds and with cat 3 pressure. So what exactly is Gustav? It is probaly best to leave well alone, and take the middle ground like NHC is doing. There's still a chance that Gustav's winds will strengthen overnight tonight if the convection wraps back around. It's lways better to be on the safe side. 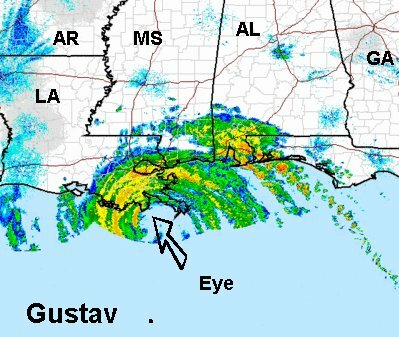 Gustav is now within 12 hours of making landfall. Landfall will be on the coast well south of Houma, LA. Landfall time should be near 8 am Monday morning. Buoy and cman stations indicate that winds are now gusting to around 60 mph just offshore. The weather will deteriorate very rapidly later tonight. Buoys in the Gulf south of Mobile and Pensacola indicate about 20' seas at this time. Seas could be up to 40' or higher in rouge waves off of the Alabama, Mississippi and southeastern Louisiana coast. Gustav is now strengthening. I.R. 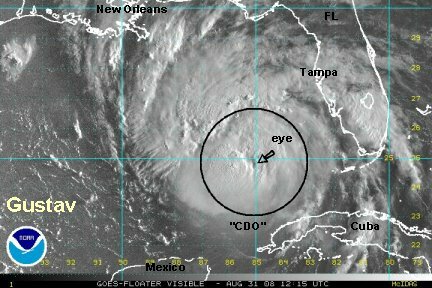 satellite imagery now shows a nearly symmetrical CDO (central dense overcast) and expanding eye wall. 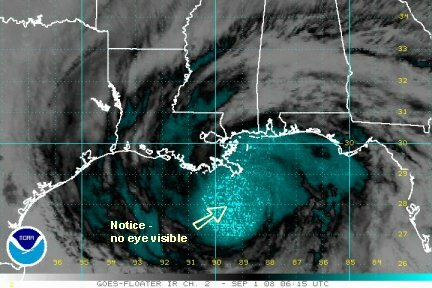 Gustav will likely make landfall as a strengthening hurricane unlike many others that weakened before landfall like Katrina and Opal. There have been no recent Hurricane Hunter reports. No doubt they will find a lower pressure than the previous 953 mb that was measured earlier. Surface winds were not up to cat 3 strength as explained in the previous update. They may be close soon. The wind field is expanding also. This means that a larger area will receive tropical storm force winds. We don't have any new recon reports, only satellite imagery and buoy data. Buoys south of Mississippi and Alabama have seen seas increase to about 26'. Seas just offshore of southeast Louisiana have seen a rapid rise and are now at 10'. The shortwave satellite imagery is a harbinger of bad news. 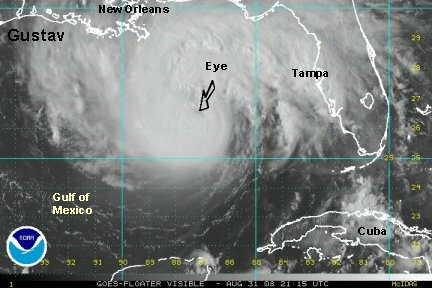 The eye has become very well organized and is shrinking in size. It is not apparent on the I.R. imagery yet, but as you can see on the Tropicast below, the eye is well formed. The eye appears to be heading a little farther east, toward the Grand Isle area. The models in the last runs had Gustav making a northwest jog just before landfall toward the coast south of Houma. If this jog doesn't take place Grand Isle is going to be closer to the landfall position. The new I.R. just came in. The eye is now showing. Gustav is strengthening for sure. We'll pass along the recon pressure soon as we get it. It's not going to be pretty. Hopefully everyone is prepared, it's about to get rough. Stay safe! The recon just reported a pressure of 955 mb. Amazingly this is not much different from the previous flight. We still expect the pressure to drop and the winds to pick up soon. More recons should be coming in soon. 955 mb would still fall in the cat 3 range. The winds are lower as we mentioned in a couple of updates ago. The winds should pick up soon since the eye is shrinking in size and the eyewall is expanding. Great news to pass along. Shortly after the eye appeared to be organizing, it collapsed. This is a most unusual turn of events. This is something that you just don't witness happening very often. (You can compare the current satellite image with the previous one and see the difference.) Usually when you see the eye appear and shrink you can bet on a strengthening phase. The anticipated turn has also occurred. Last update we mentioned that the models were calling for a turn shortly before landfall. It is in progress now and the landfall looks like south of Houma on the coast. The pressure now down to 954 mb. Again, this is usually in the range of a solid cat 3. The last recon measured a flight level wind of 118 mph. The surface wind would be considerable less than that since it was measured at 10,000 ft. Also, unfortunately the radar from New Orleans is now out. Seas remain very high. The latest buoys south of Mississippi and Alabama continue to rise, now at 29'. Some seas up to 40' are still posible, but likely lowering if the winds continue to drop. Rainfall: still will be quite heavy with 5-10"+ amounts along Gustavs path. Brief commentary.....I was posed a question of why we were predicting strengthening earlier and that there was no sign of it showing up. NHC has been playing a necessary political weather game today. They have had the winds at cat 3 all evening and there has been NO evidence of surface winds were that strong. When we mentioned strengthening, we meant that the structure was getting better organized at the time. The actual observed winds have been in the cat one range and by strengthening would have put them into the cat 2 or 3 range. 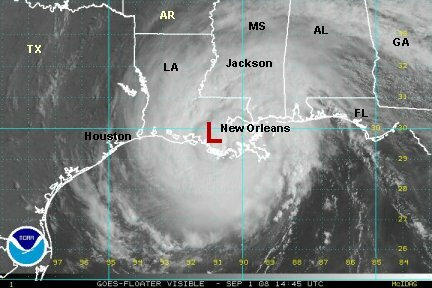 Now, being in NHC's position where a hurricane was bearing down on New Orleans and it previously had winds to 150 mph and there was the threat of it strengthening....What would the right call be? The winds are at cat 1 level, but what if they increased just before landfall? NHC did the right thing by keeping the winds steady at 115 mph. If they said top winds are at 80 mph, many people would not gotten our of harms way. And what if it did strengthen at the last minute? Many more people could possibly have been harmed. Again, NHC did the proper thing. Another problem causing confusion is that Gustav is a mix. On the Saffir-Simpson scale...it has solidly a cat 3 pressure, seas are 30-40 feet which is usually generared by cat 4 or 5's, and the surface wind which is in the cat 1 range. 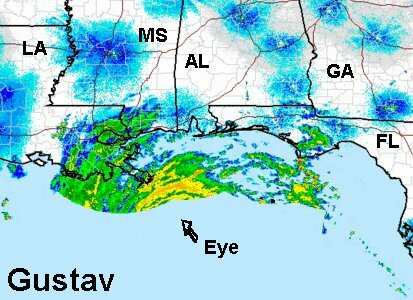 Gustav is technically making landfall now. The eye wall is touching land now south southeast of Houma. The center of the low is still offshore and should be moving inland in the next couple of hours. The Hurricane Hunters found that pressure had not changed with the last pass at 956 mb. This would normally be a pressure solidly in the cat 3 range. Surface wind were at almost 100 mph. NHC noted in their last advisory that winds have not changed and that 115 mph was probably a generous estimate. The actual "real winds" have increased a touch with that Hurricane Hunter measurement of nearly 100 mph. The passes before that winds were in the cat 1 range. On a brief check of buoys, oil rigs and cman stations, a 86 mph wind was noted in the past few hours and seas were up to 18' just offshore of southeast Louisiana. Seas south of Mississippi and Alabama were higher, with a buoy reporting a wave height of 34'. Again, Gustav remains a bit of a quandary, with pressure and seas representative of a more powerful hurricane than the winds are. Keep in mind tornadoes are a threat with a land falling hurricane. Flooding is also a huge problem. Inland flooding causes more deaths than any other aspect from a hurricane. Heavy rain of 5-10"+ will be encountered in Gustav's path through Louisiana, into Arkansas, and into some neighboring states. Gustav should slow down and move into Arkansas and Missouri over the next few days. Heavy rain in the range of 5-10" + can be expected with isolated amounts considerably higher. Doppler radar estimates already 5" in southern Mississippi and southeastern Louisiana. Remember don't drive over flooded roadways. It takes only about 2 feet of moving water to move a vehicle. A tornado watch is in effect for several Gulf coastal states from Louisiana eastward to the Florida panhandle. Remember tornadoes may give little lead time to take shelter. Make sure that you turn your NOAA weather alert radio on, or stay in contact with other media. 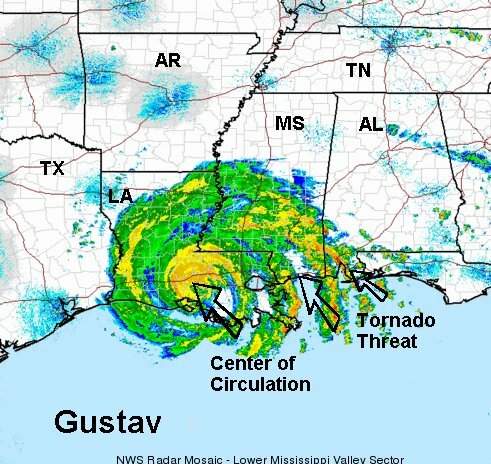 The center of Gustav is near New Iberia, LA. Very heavy rainfall is located near the center of circulation and some of the squall bands coming in off of the Gulf farther east. Doppler radar estimates are now near 6" locally in southern Mississippi and southeastern and south central Louisiana. Remember don't drive over flooded roadways. It takes only about two feet of moving water to move a vehicle. Currently there are several tornado warnings in effect. Cells coming in off of the Gulf, especially into southern Mississippi and southern Alabama show rotation. Remember tornadoes may give little lead time to take shelter. Make sure that you turn your NOAA weather alert radio on, or stay in contact with other media. Since Gustav in now inland, this will be our last update due to several other tropical threats that we want to give more attention to now. A summary may be posted in the next couple of days.